Whether you are shipping large packages or small parcels, the Ultraship 75 Lb. Electronic Digital Shipping postal scale from My Weigh guarantees precision and accuracy. With a 55lb/25kg capacity along with a dual range design; the Ultraship 75 is ideal for home use, office or small business. It can run on batteries or AC adapter and also includes accessories like letter tube holder, and a mail envelope holder. Other features include a Tare, Hold, and auto-off feature, programmable auto on/off switch and a digital readout conveniently detaches from scale with a 2 feet long coiled cord. So whether you're weighing foods, postcards, letters, parcels, envelopes, mailing tubes, padded packs, small boxes, medium boxes or even large boxes, this easy to use scale has been designed to suit your needs perfectly. 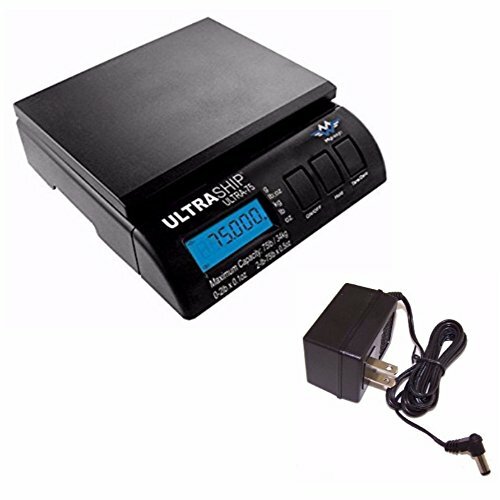 The Weigh Ultraship Power Supply Adapter is an extra power adapter for certain My Weigh products, check manufacture website for complete compatibility listings. POSTAL SCALE: With a 55lb/25kg capacity along with a dual range design; the Ultraship 75 is ideal for home use, office or small business. POWER: The My Weigh Ultraship can run on batteries or an AC adapter. WEIGH ANYTHING: With an easy to detach from scale digital readout that has a 2ft cord, you can weigh anything and small and still see the results. If you have any questions about this product by My Weigh, contact us by completing and submitting the form below. If you are looking for a specif part number, please include it with your message.